This book is the first collection on the British author Rose Macaulay (1881-1958). 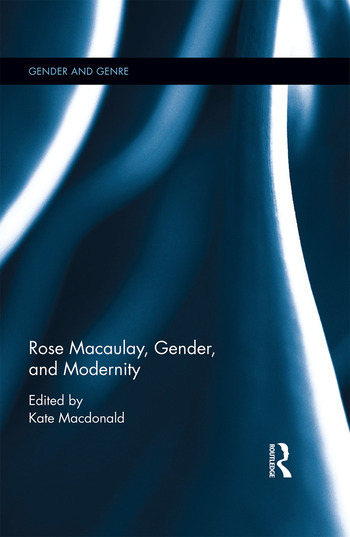 The essays establish connections in her work between modernism and the middlebrow, show Macaulay’s attentiveness to reformulating contemporary depictions of gender in her fiction, and explore how her writing transcended and celebrated the characteristics of genre, reflecting Macaulay’s responses to modernity. The book’s focus moves from the interiorized self and the psyche’s relations with the body, to gender identity, to the role of women in society, followed by how women, and Macaulay, use language in their strategies for generic self-expression, and the environment in which Macaulay herself and her characters lived and worked. Macaulay was a particularly modern writer, embracing technology enthusiastically, and the evidence of her treatment of gender and genre reflect Macaulay’s responses to modernism, the historical novel, ruins and the relationships of history and structure, ageing, and the narrative of travel. By presenting a wide range of approaches, this book shows how Macaulay’s fiction is integral to modern British literature, by its aesthetic concerns, its technical experimentation, her concern for the autonomy of the individual, and for the financial and professional independence of the modern woman. There are manifold connections shown between her writing and contemporary theology, popular culture, the newspaper industry, pacifist thinking, feminist rage, the literature of sophistication, the condition of ‘inclusionary’ cosmopolitanism, and a haunted post-war understanding of ruin in life and history. This rich and interdisciplinary combination will set a new agenda for international scholarship on Macaulay’s works, and reformulate contemporary ideas about gender and genre in twentieth-century British literature. Kate Macdonald is Visiting Fellow in the Department of English Literature at the University of Reading, UK.